Tactical Price Momentum is a highly quantitative end of day swing trading strategy for trading individual stocks and ETFs. Trade signals are generated after the market closes and orders are submitted for the next trading day. Trades last anywhere from a few days all the way up to several weeks, depending on the type of signal and market cooperation. All buy and sell decisions are based on specific price action and volume behavior. Get Trade Alerts Texted & Emailed To You In Real Time. Are you outside of the United States? No problem! We deliver text messages to over 100 countries worldwide. 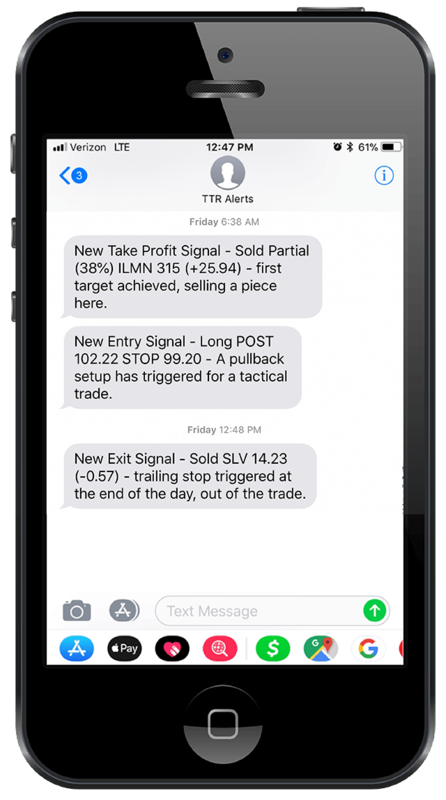 Any time a trade signal is generated for a new entry, profit target, or exit, you will be notified via SMS text and email. We also keep a member-only trade management page updated so you can view the latest trailing stop loss levels and profit targets 24 hours a day. Moderate and aggressive portfolios take the same signals they just use different position sizes. Traders can scale this return profile lower (use less size) or higher (using options or margin) to fit their desired risk profile. For more detailed information and past trade examples, visit our trading performance page. Everything you see on The Trade Risk comes exclusively from Evan Medeiros, a professional trader with 10+ years of active trading experience. "So far, three months in, I am very satisfied with the service. As my personal knowledge of the service has improved and my confidence has increased, I now am trading an average $30,000 on a fully invested trade. I track things closely and the returns in my The Trade Risk (TTR) account are significantly better than when I trade on my own in other accounts. I have been a trader for several years, but unfortunately, I never found the consistency that I needed. TTR has really made me a happy trader!" "Evan provides me the cool-calm-collected thought process that I need in volatile markets. His free information was helpful, but his premium service is where you get his well thought out trade alerts. Working a full time job, I don’t have the time to do all the research needed to be consistent. Evan's alerts make it easy for me to punch in the trades at work. Just don’t tell my boss ;-)"
"Thanks for the service you provide. The videos and text are very well done and much appreciated. As a new trader, I have found the service very helpful in keeping me on track especially with regards to FOMO and the urge to constantly push buttons." "I have been following Evan’s service for more than 4 months and the result have been more than satisfactory and so to speak, very profitable. Evan’s daily commentary helps navigate through the market changes and assess one’s trading plan when to get aggressive and when to be conservative. I would recommend Evan’s service to all my friends interested in stock trading. For traders looking for momentum, Evan’s service is definitely the one to go for. " You can visit our complete testimonials page here. What is the difference between signals & premium memberships? Our signals membership is designed for traders who only want trade alerts, without any of the trading tools, trade recaps, or education about how the strategy works. Our premium memberships are designed for traders who want to learn the rules and philosophy of the swing trading strategy and understand the rationale behind every buy and sell decision. Premium plans contain over 40 hours of recorded video sessions, PDFs for download, and much more communication about open positions and the strategy. If you're a new trader or really want to learn the nuts and bolts of the strategy, the premium plan will give you the examples and documentation you're looking for. If you're experienced or just interested in following along with the output of the swing trade strategy, the signals plan is for you. You can always start off with a monthly premium plan and then swap to signals once you've got the hang of the strategy. What exactly does end of day trading mean? It means all new trade signals are generated based on daily time-frame closing prices. After the market closes for the day we run scans to find stocks that meet our entry criteria and submit orders to enter those positions during the next session. Spend less time staring at markets during the day. Fewer, but more quality, decisions to make. Avoid intraday volatility and whipsaw. Focus on more reliable data points. Instill a natural layer of discipline. Ability to trade the market entirely after hours if desired. Profit taking and stop losses do occur intraday but because we'll always know those levels ahead of time we can have orders placed with our broker so we don't need to babysit the charts. What do the trade alerts look like? At the end of every session, a Trade Report is generated with all of the activity from the day. The report also includes upcoming trade setups for the next trading session. This means you will have plenty of time to research the setups and prepare orders so you are not left scrambling in real time to get into trades. What are the automated trading tools? The foundation of the trading process. This tool systematically measures trend, momentum, and breadth to give a reliable and objective outlook on the market environment at all times. Also known as a ”leadership list,” it is a weekly curated list of strong stocks based on specific technical scan conditions (you will also be given the criteria). A customizable position size calculator that brings together multiple measures of risk management so you can size your trades quickly and accurately. We do not trade options. All of our swing trade alerts are issued on underlying stocks & ETFs only. We do have options traders that subscribe to us for signals and express the trades using options on their own. The majority of the names we trade tend to have liquid option chains. Yes! We trade liquid inverse ETFs for our short exposure to eliminate company specific overnight risk and to allow full participation from retirement accounts. Because new subscribers get instant access to our open trades, analysis, and the entire archive of educational material (for premium memberships) we do not issue any refunds. Canceling your account is extremely easy. Simply log in to your Trade Risk account and head on over to the Account page and click on the cancel link under your membership level. At that time your Trade Risk account will be closed out and you will no longer be billed going forward. There's no need to contact anyone to cancel, you can do it on your own, at any time. Join month-to-month or save 30% with a semi-annual plan. Please be advised that trade alerts are provided as an educational tool for informational purposes only and do not constitute investment advice. 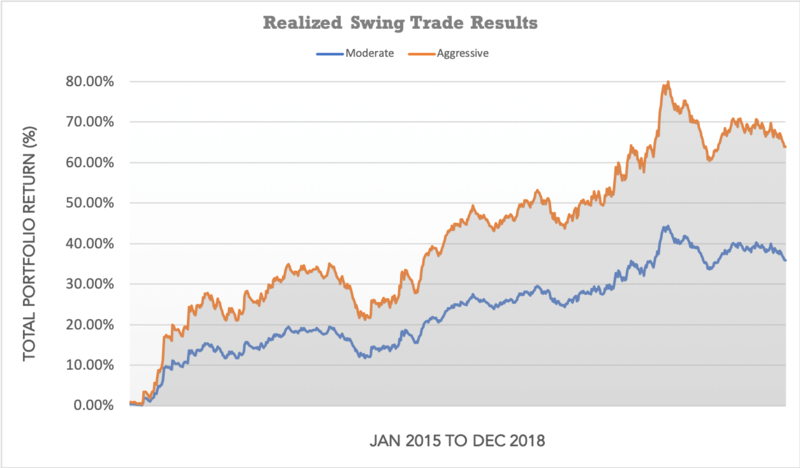 Swing trade alerts, trading tools, and all published analysis should always be used as a starting point for doing additional independent research so that you can form your own opinion regarding investments. Under no circumstances should trade alerts be treated as financial advice. The author of this website is not a registered financial adviser. Before subscribing read our full Disclaimer and Terms of Service. Acceptance of these terms is required before subscribing.